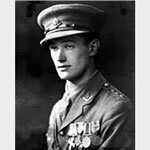 Temporary Lieutenant Bennett, of the Worcestershire Regiment, when in command of the second wave of the attack, found that the first wave had suffered heavy casualties. Its commander had been killed and the second line was wavering. Lieutenant Bennett advanced at the head of the second wave and by his personal example of valour and resolution reached his objective with but sixty men. Isolated with his small party, he at once took steps to consolidate his position, under heavy rifle and machine gun fire from both flanks, and although wounded, he remained in command, directing and controlling. He set an example of cheerfulness and resolution beyond all praise, and there is little doubt that, but for his personal example of courage, the attack would have been checked at the outset. In the aftermath of the Great War, Eugene became a Freemason, joining the Lodge of Felicity, No. 58, in London in 1922.